One of Cornwall's newest museums had to be given lottery money to help it weather a major financial crisis. 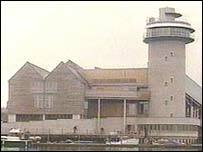 Falmouth's National Maritime Museum said it had experienced problems with visitor numbers after failing to meet projections for the business. A five-year programme of education and outreach work is being paid for with £1.45m from the Heritage Lottery Fund. Director Jonathon Griffin said the museum was changing to survive and that it was re-organising its operations. The museum, which cost £28m to build, was officially opened by the Duke of York in March 2004, but opened its doors in 2002 when it was the venue for the launch of the Queen's Golden Jubilee tour. It was set up with a mission to promote an understanding of small boats, as well as Cornwall's maritime heritage. It attracted 45,000 people in its first month. It was reported in October 2004 that it had seen a 20% decrease in visitor numbers. The museum said its original trading projections were ambitious and "visitor numbers, and therefore income, had not lived up to the original expectations". It said some of the problems had been local and included the weakness of tourist numbers within Cornwall, and the fact that development work at neighbouring Discovery Quay was still unfinished. It added that transport problems in the area prevented visitors from easily reaching the site. The museum also said it was also at a disadvantage because it did not receive national funding as other museums did. Director Jonathon Griffin said: "We're trying to square that circle, and that is extremely difficult for us. We have to work that much harder to survive." Carole Souter, Director of the Heritage Lottery Fund (HLF), said: "It is common for new attractions like this to revise their business plans and HLF, along with other partners, continues to support the National Maritime Museum Cornwall in its award-winning home as it further widens its appeal."